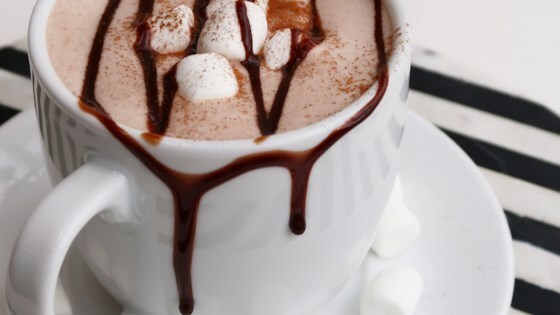 "I wanted to use up some full-size chocolate bars leftover from Halloween and decided to make hot chocolate out of one. The result was fabulous!" Place chocolate pieces in a saucepan over medium-low heat; add milk and whisk constantly until chocolate is melted and well blended, about 5 minutes. Whisk in cinnamon. Remove from heat; add more milk if desired. Serve in a mug. I made this into an adult cocktail by adding a healthy jigger of Smirnoff Whipped Vodka. Very good. ok. very sweet. i'm going to just assume I'm not that big of a hot chocolate fan. I'm going to try this with the pumpkin spice bark I got on clearance. :3 Should be a wonderful compliment to Thanksgiving dessert! Rich and creamy. I used part dark and part milk chocolate bar. Topped with whipped cream. Tastes special and is easy to make in the microwave. Whisk frequently. WOO I am excited to try this! We have a HUGE snow storm heading my way and I forgot to buy the kids hot chocolate while i was at the store. I am so happy I found this! Thank you!! That was some dang good hot chocolate.